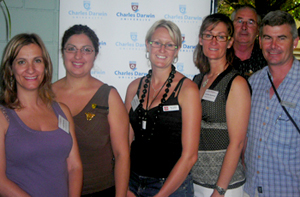 School career advisors from as far away as Adelaide and South Australian country towns were involved in Charles Darwin University’s Career Advisor’s Information Day on Friday (March 16). Fourteen school career advisors from South Australia accepted the offer to attend the Information Day, designed to showcase the variety of courses available to students in an ever-broadening market. With interstate numbers now on the increase, CDU is targeting markets such as Adelaide to attract senior high school students to the Top End. The interstate guests were accommodated at North Flinders International House, giving them the full boarding experience to pass on to their high school students. 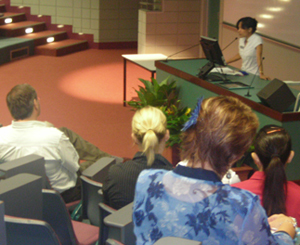 Other career advisors came from Darwin high schools and as far away as Nhulunbuy. Careers and Student Recruitment coordinator Adelia Mu-Prasad welcomed the career advisors and gave them an overview of recruitment at CDU before faculty heads spoke about the particular requirements of their courses. She also urged the career advisors to advise their students to take advantage of the CDU website to gain information about courses. During morning tea third-year students Marwa Osman, David Heath and Diane Watson gave their own insights into how they had come to study at CDU. In a frank exchange of views the students passed on their own experiences and those of student colleagues about the benefits of student counselling in senior secondary school. Marwa Osman, who came from Sydney to study pharmacy, said students should be encouraged to look more closely at the course requirements before deciding on their field of study. She said Year 12 students had such a narrow view of education because all they wanted to do was get high marks to get into university. She urged them to choose to study something for which they had a passion. However, social work student David Heath said that many students did not really know what was their ‘passion’ while they were still at high school.